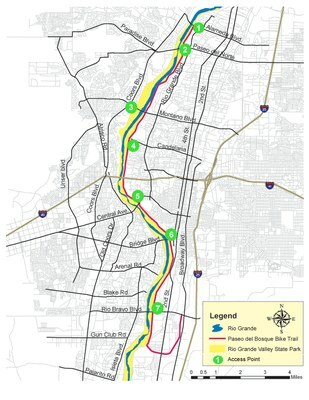 Albuquerque's premiere multi-use trail, the Paseo del Bosque Trail, goes from the north to the south edges of the metro area through the Rio Grande's cottonwood bosque (forest). 16 miles of paved multi-use trails uninterrupted by roadways. Enjoy public art along Tingley Beach, Central Avenue, and other locations. Trail passes through the Rio Grande Valley State Park. Great opportunities to see the Rio Grande Nature Center the Albuquerque BioPark and the National Hispanic Cultural Center. Note that the only formal restroom facilities currently available on the trail are located at the Alameda access on the southeast side of the Alameda bridge. The Paseo del Bosque is a multi-use trail. You may encounter many different kinds of users. Expect to meet bicyclists, walkers, runners, people with wheelchairs, in-line skaters, equestrians, families with strollers, among others. Always remember that courtesy and caution are a part of having an enjoyable and safe experience on Open Space trails. And remember to always keep your dog on a leash and clean up after your dog. It's the law. The numbers below correspond to access points shown on the trail map. Parking: Alameda offers ample parking and easily accommodates horse trailers. Access is on the southeast side of the Alameda Blvd. bridge. What to See: From the Paseo del Bosque Trail, you can view ducks geese and other wildlife enjoying the Alameda Wetland. This constructed wetland is intended to replicate the natural wetlands that historically occupied the floodplain of the Rio Grande. 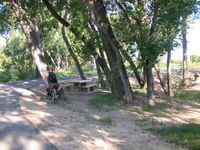 At the northeast corner of the Alameda bridge, distinguished cottonwoods shade the picnic area from the New Mexico sun. Parking: Access to the Paseo del Bosque Trail is from Paseo to 2nd Street, turn on El Pueblo Road and then west to Rio Grande. There is a parking area at the southwest corner. Parking: Pueblo Montaño is located south of Montaño Road; east of Coors Boulevard; and west of the Rio Grande River. The parking lot includes dedicated ADA and equestrian-parking areas. What to See: This multi-use recreational facility provides West-side access to the bosque trail-system. You can also enjoy the wood carvings at this site. This area was severely affected by the 2003 bosque fires and Open Space turned this tragedy into a unique, informative and artistic expression for the love of the bosque. Local artist and firefighter Joseph Mark Chavez has carved representative pieces from the cottonwood tree stumps left intact. This site also includes an ADA-accessible picnic area and trail. Parking: There is no parking at this site but there is access to the Paseo del Bosque Trail. At the 4-way intersection, you have four options: If you head north you'll arrive at the Nature Center, the west and south sections will allow you to travel on the Paseo del Bosque Trail and the east section will take you onto Campbell Road. What to See: Check out the nearby Rio Grande Nature Center, managed by New Mexico State Parks. This wonderful and educational visitor center overlooks a thriving pond that attracts a variety of wildlife including Canada geese, sandhill cranes, several species of ducks, and coyote. Walk along the two-mile loop trail which guides visitors under the cottonwood canopy to sandy point bars along the Rio Grande. To the north of the Nature Center, visitors can observe wildlife enjoying the Candelaria Farm Wetland Preserve. The Wetland is part of an ongoing effort to restore lost habitat in the Rio Grande floodplain. The Nature Center is located at the end of Candelaria Rd. west of Rio Grande Blvd. There are no bikes allowed at the Rio Grand Nature Center. Parking: Located on the northeast corner of Central Avenue Bridge. Please access this formal parking area off of Central directly west of Tingley Boulevard. We're very pleased to announce that ADA compliant parking spaces are available at this site. What to See: There is a sculptural piece at this site by local artist O.K. Harris. There are two picnic tables on site. Also, you can walk to the water's edge from this parking location. Nearby, you'll find Tingley Beach, which is a nice surprise between Central Avenue NE and Marquez Street. If you're not on the Paseo del Bosque Trail but still interested in this destination spot you can access the parking area from Tingley Boulevard by traveling south on Central and turning east onto Tingley Boulevard. From here you can enjoy the Tingley Beach Public Art walking tour. This spot will allow you access onto the Trains at the BioPark. View more information about the Public Art Bike Tour. Parking: From Bridge Street heading west, turn north on 8th Street and then turn west again on Marquez Street. Marquez Street turns into an Open Space parking area which is perfect for access to the Paseo del Bosque trail. What to See: Following the trail south will take you to the National Hispanic Cultural Center. Following the trail north will take you to the Central Avenue parking area and the ABQ BioPark. Parking: To arrive at this parking area from I-25 head west on Rio Bravo and turn north on Poco Loco Street. Poco Loco Street is west of 2nd Street right before the bridge crossing the Rio Grande. What to See: At the Rio Bravo Riverside Picnic Area you can enyoy the walking trail as well as the picnic tables.